When I was a banker we had this tool to show you how much you’d pay in interest over the amortization. When you look at the bottom of the chart I always liked to point out that you basically pay the same amount in interest as you took out on a mortgage at an average mortgage rate. Cripes! If your house doubles in 25 years you’d still be flat. Now that interest rates are low here is how to take some of the “ouchie” out of that number. 1. Set your payments from monthly to bi-weekly–or even better weekly. Bi-weekly payments mean you make one extra monthly payment per year compared to monthly. 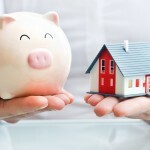 Over the amortization time of your mortgage these extra payments will save you thousands. 2. Round up your payments. If your weekly payments are $429.68, for example, round them up to $500. The extra $70.32 weekly will save you even more over the amortization of your mortgage. Plus round numbers are nice to see when you’re adding up your expenses at the end of the year. I’ve shaved two years off my amortization by doing this! You will be paying down your principal very quickly, which will equal less principal to pay back when rates go back up. It will save you bundles in the long run. You’ll also be used to the payments at a higher interest rate. When you need to renew or decide to go with a fixed rate, you’ll have a few years of already making payments at that higher rate. 4. Get rid of the extra insurance the banks offer you. Make sure you are covered through work or get proper term and disability and then plop that extra money on your mortgage. I use to get huge bonuses on my disability and life insurance sold on mortgages. If the banks make tons of money off it – it’s not a good deal for you. 5. Dump your RRSP contributions back onto your mortgage if you don’t have consumer debt or RESPs to fund. It’ll help you finish off the mortgage faster. If you get any unexpected money from insurance or estates – put it on there too and feel good about where it went. It won’t be wiped out if the market moves in the wrong direction or we have another “flash crash” because of the Skynet like trading computers. I always get asked the question if people should save or pay down their mortgage and the easy answer is pay down debt. It’s a guaranteed return. The market has been making good gains coming out of the recession but check your portfolio regularily. Calculate how much you have been participating in those gains after fees, diversification, and inefficient markets. What the TSX average does, performance wise, is rarely what mutual funds do. Try out some of the mortgage calculators online to see how much interest you save with the different options, along with how many years you’ll “bump off” your amortization, instead of it bumping you off. Mortgage free years are years that you can spend that mortgage money on your extra special life!